the bank and ditch feature. The turf was difficult to remove, probably due to the recent dry weather. the clay, suggesting the reinforcement of the bank. 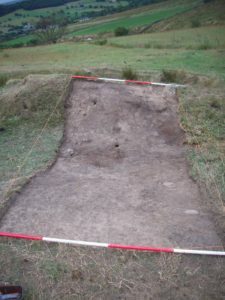 The outside ditch contained a strip of darker soil. This could be a furrow from the ploughing in the adjacent area. Alternatively, the darker area could have been caused by the roots of reeds. Further investigation is needed in this area. 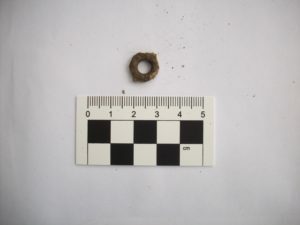 Finds were made in the topsoil and the junction between the topsoil and the clay layer. 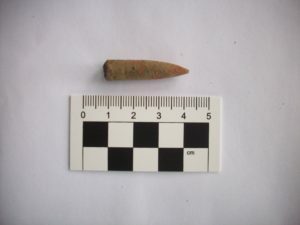 These include a piece of modern glass, bone, eyelet, chert flakes and a bullet.